Description: This flask appears to be modelled on Johnnie Walker whisky. 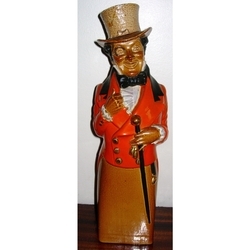 It is just over 12 inches tall, the top hat (which has been repaired) is attached to a cork stopper. Underneath is the impressed stamp for Doulton Lambeth England which would date the piece between 1891 and 1956. Our gut feeling is that this is quite early. All very obvious, but why cannot we find another example? Surely there must be more of these flasks? Status Comments: Thanks to Steven Parkes and The British Antique Bottle Forum this has been confirmed as an extremely rare Doulton Lambeth Johnnie Walker whisky flask. This was sent to BBR Auctions for sale at their auction on Sunday 26th April 2015 and sold for £520.